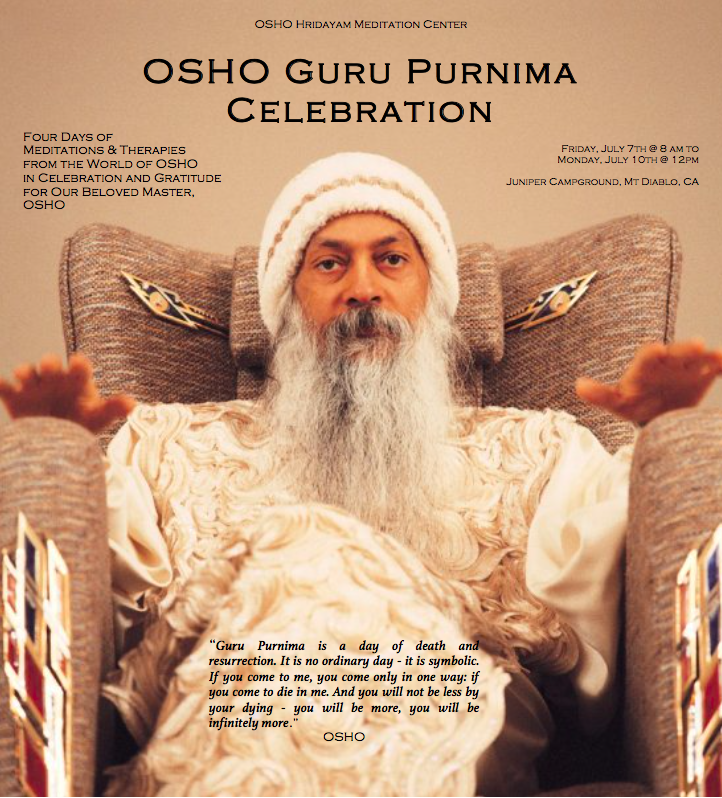 Notice: Those who are attending the Mountain Retreat for Guru Purnima Celebrations, please Register/Rsvp/Contribute by clicking this link to the Guru Prunima program details page here. The below form is only for the Friday Weekly Meditations. Finding an impactful meditation from selection for daily practice. Ability to touch meditation for a few minutes a day. Experiencing an hour's taste of the blissful nectar of ones own being. Transforming toxic poisons into blissful nectar of compassion and meditation for the benefit of the world and oneself in it. Entering unperturbed watchfulness as meditator's lifestyle. On March 21, 1953 at the age of twenty-one, Osho became enlightened. Purnima Full Moon in the lunar month of Ashada, the month beginning the relief provided by monsoon rain to a parched hot land through ferocious dark clouds and winds laden with potential of rain. The actual dates vary year to year. 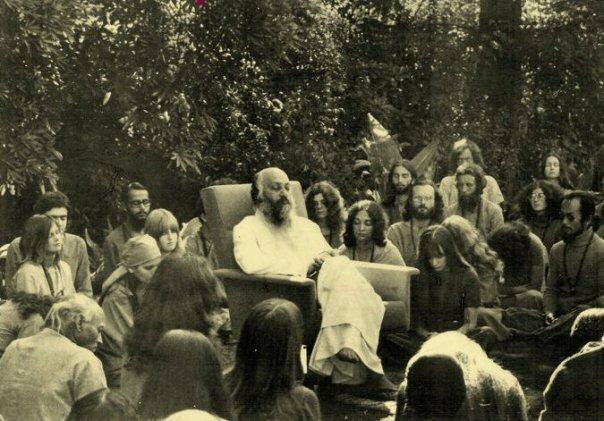 After Osho’s father, Swami Devateerth Bharti, left his body, enlightened on September 08, 1979, Osho created an annual festival, the Mahaparanirvana Day, to celebrate all sannyasins, past and future, who have died and will die enlightened. This day is celebrated by all Sannyasins and lovers of Osho all over the world. "He was meditating for years. He was a rare man -- it is very rare to find a father like him. A father becoming a disciple of his own son: it is rare. Jesus' father did not dare to become a disciple, Buddha's father hesitated for years to become a disciple. But he was meditating for years. Three hours each day, in the morning from three to six, he was sitting in meditation. Yesterday also, in the hospital also, he continued. Yesterday it happened. One never knows when it will happen. One has to go on digging...one day one comes across the source of water, the source of consciousness. Yesterday it happened; it happened in right time. If he had left his body just one day before he would have been back in the body again soon -- a little clinging was there. But yesterday the slate was completely clean. He attained to no-mind, he died like a Buddha. What more can one have than Buddhahood?" Osho has blessed this planet by being born here on December 11, 1931. June, July, August, September are the ideal months for Meditative Outdoor Retreats in the Bay Area, and we request participants to keep your weekends relatively open during these months, in anticipation of Meditation Retreats. We will try to have 2 or 4 day camps once a month during this period. June - 2 day meditation retreat, July - Guru Purnima 4 day retreat, August - 2 day meditation retreat, September - Mahaparinirvana Day 4 day retreat, October - 2 day meditation retreat. Its especially helpful to recognize that you will be taking 4 days off work in these 5 months, and may need to give advance notice to your organization for your spiritual festivals. Guru is like full moon and disciple is like Ashadh (the month of clouds and rains). The moon of Sharad Purnima is beautiful because it is in the empty sky. There is no disciple then, the Guru is alone. If the same beauty happens in Ashadh, then it is something, where the Guru is surrounded by clouds like disciples. The disciples have come with their darkness of many lives. They are like dark clouds, they are the weather of Ashadh. If the Guru can shine like the full moon in that atmosphere of darkness, if he can produce light in that atmosphere of darkness, only then he is the guru. That’s why Ashadh Purnima is Guru Purnima. It has an indication towards the guru and an indication towards the disciple. And naturally, where these two meet, there is meaningfulness. A real guru is the one who liberates us and with whom we are in deep love, faith and reverence. A guru is a presence. Through him one gets the first glimpse of divinity. A guru creates, transforms and gives a new birth to a seeker so that with complete trust one can follow his guru while travelling through many unknown paths and doors. The guru’s blessing is a vital phenomenon. Through a guru one can look into his own future and can be aware of his own destiny. Through him one starts coming up like a seed trying to sprout towards the sky. Attendance of playful practise of meditation we designate as Leela 1 and Leela 2. Leela 1 is the weekly play of exploring meditations at the meditation center to find a impactful meditation. Leela 2 (whose pre-requisite preparation is from Leela 1) is the quarterly or half yearly weekend meditation retreats to have a taste of the nectar of soaking in your own being. Leela 3 (whose prequisite preparations are Leela 1 and 2) is the yearly 4-day meditations for which we take breaks from work to allow the nectar of meditation give confidence to break even addictive western lifestyle choices leading you to your inner freedom from compulsions. This event being a 4-day meditation will provide accomplishments for those who are properly prepared for the meditative journey through the pre-requisites. ​Kindly note that the time commitments required for the depth of understanding and experience to unfold, have been experientially determined to provide a fair chance for attendees for their success and we request attendees to adhere to the basic requirements determined based on the common biological, mental, social conditioning from society. We are very flexible with the attenance for weekly Leela, and fairly flexible for 2-day weekend Leela 2, and inflexible for Leela 3, to accomodate the intensifying needs of the seeker who has made this inner life, the light of his personal freedom and joy. We always make exceptions for people, who are looking to these events for inspiration only (not on-site practise accomplishments), so that they may take all the inspiration they need to spark their joyous initial exploration of finding daily meditation confidence. During the retreat, we will have a rigorous schedule of meditations and therapies with a few breaks to help facilitate a deep exploration into our being and the breaking of old patterns. We ask that you try to keep the silence and speak only if necessary. 7 am - Wake, tea. Please become familiar with these meditations before the retreat. If necessary, we can arrange an informal dinner with Swami to discuss the retreat with participants on the 4th of July for those interested as to avoid talking during the retreat. You are also more than welcome to call and talk with Swami about any questions, 510-910-8501. Please read the meditation and therapy overview for the retreat here. We will be at Juniper Campground at Mt Diablo. Kindly arrive on Friday morning as early as possible (8 am) so that we can set up. We will be there until Monday (12 pm). We ask that you try to arrange your schedule so that you are able to attend all four days as this is a deep meditative retreat and any disruption would be best avoided. Please RSVP as soon as you are able as space is limited and it will influence my planning. We ask that you bring anything you will need to keep you comfortable in a fluctuating climate. The days are usually quite warm, but the night gets very chilly. If possible, a large brim hat is very useful during the day as there will be very limited shade. You might also consider sunscreen if you are sensitive to the sun. There are coin-operated showers if you choose to use them near the site. Food and tea (chai and herbal) will be provided. Please email with any food allergies or dietary preferences. Bring anything that you would like to share. Juniper Campground: (36 sites, elevation 3000 ft). Located approximately 2 miles below the summit on Summit Road, Juniper is known for its views. Live Oak Campground: (22 sites, elevation 1450 ft.) Located one mile above the Southgate entrance Station, off Southgate Road. Live Oak is near Rock City. Junction Campground: (6 sites, elevation 2200 ft.) Located where Southgate and Northgate meet at the Ranger Station. This campground is situated in an open woodland area. All campsites are provided with picnic tables, fire pits or stoves, water and rest rooms. Showers are available at Live Oak and Juniper campgrounds, at no additional charge. Pay phones are located at the Junction Ranger Station and the Summit Visitor Center. Cell Phone Service is variable. Juveniles (under 18) must have written permission from parents. Fire must be in stoves or barbeques provided - no ground fires. Noise must not carry beyond your immediate camp or picnic site. All alcoholic beverages prohibited in park. Quiet hours 10 p.m. to 6 a.m. No electric generators 8 p.m. to 10 a.m.
8 persons and 1 vehicles.